Is it possible to add a link from the profile page to the gallery? To whoever works on this site. There are quite a few times where someone will mention something they have added to the gallery. 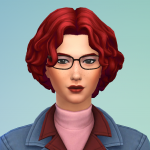 So I was thinking if there a way, on the profile page if a link could be added that would connect to the simmer's work on the gallery? This is a great idea, @LaBlue0314! Unfortunately, it's not something possible to do right now - but I'll keep it in mind in case that changes in the future. Find my creations in The Gallery!